May 2018 P.E.A.C.E. News - P.E.A.C.E. All of us, including the children we care for, are facing unprecedented perils and opportunities as the President’s war-oriented foreign policy team is moving toward negotiations with North Korea and disruption of the multilateral agreement to keep Iran from producing nuclear weapons. At the same time the U.S. Senate is beginning to consider a new Authorization for the Use of Military Force (AUMF) Resolution, which would only require the President to consult Congress on future uses of our military forces apart from the war on terror. We do need to join in protests against the Administration’s plan to impose sanctions on Iran. We need to join in with the voices hoping for a multilateral agreement with North Korea to end the Korean War and denuclearize the Korean Peninsula. At the same time we need to contact our Senators to ask them to support amendments to the Corker/Kaine draft AUMF Resolution, to reassert Congress’ Constitutional authority to decide on U.S. use of military force in all cases. May 1 was National Worthy Wage Day. We need to keep up the pressure on our State Child Care Lead Administrators to use significant portions of the new Federal Child Care and Development Block Grant (CCDBG) funding for improvements in child care pay and benefits, such as health insurance and sick leave. This will build peace among young children by making child care a more affordable profession, leading to better staff retention and quality. 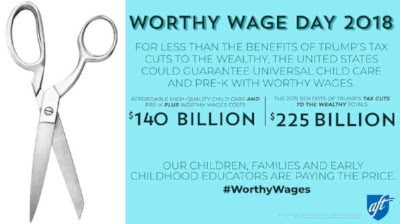 You can find much more information, as well as action suggestions such as inviting legislators or local “influencers” to visit your program to talk about child care pay and other issues you care about, at https://www.aft.org/earlychildhood/worthy-wage-day-2018 . If you do have a visit, please let us know so that you can be a positive example for others, through our monthly News. Register and Vote! Finally, we all need to work on getting out the vote this year, including our own votes on the primary and general elections. Whether we and our friends vote or not this year will have a major impact on how our country and our communities behave in the following two years, peacefully or otherwise. Child care centers should do what they can to encourage registration and voting among both employees and parents. As P.E.A.C.E. moves forward, we need your help and your input. June 3, please let us know through 1peaceeducators@gmail.com . you to tell your friends and colleagues about them, please do forward them. Thank you!